Sandeep has engrossed several roles in his career, which consist of a serial entrepreneur, philanthropist and internet visionary. But he is better known as the founder of Shopclues and Droom. He has 17 years of global experience in business operations, strategy and investment, focusing on Internet and technology. He is counted amongst leading Internet experts globally and has regularly appeared on several prominent media outlets. It is often considered to be a visionary and go-getter. His earlier work as internet analyst gave him the needed leverage to become one of the pioneers of digital revolution. His latest venture Droom, is India’s first online marketplace to buy and sell new and used automobiles and automobile services. Droom has taken a completely innovative and disruptive approach to building trust and pricing advantages. Prior to founding Shopclues and Droom, he was provided research coverage on Google, Yahoo!, eBay, Amazon, Microsoft etc. as an Internet analyst. He has an MBA from Washington University in St. Louise, USA. He is also a chartered member of TiE Silicon Valley and holds one US patent. “Founded in April 2014 in Silicon Valley, Droom is India’s first online marketplace to buy and sell new and used automobiles and automobile services. Droom has taken a completely innovative and disruptive approach to building trust and pricing advantages for buyers. The current experience of buying and selling an automobile is completely broken, antiquated and full of pitfalls. Droom offers a truly 21stcentury experience in buying and selling automobiles. With its technology-driven marketplace approach, Droom enables transactions between buyers and sellers by bringing transparency, building trust and mitigating information asymmetry. Droom is a mobile-first marketplace with a presence on three platforms i.e. Android, iOS and Desktop. Droom is amongst the fastest growing consumer Internet companies in India with 9k+ B2C sellers, 15k+ products, 6k+ listings, $85mil.+ in listed GMV, 700k+ FB Community members (highest for any automobile community in India) and over 500k+ downloads for mobile apps. Sandeep Aggarwal is a serial entrepreneur, philanthropist and Internet visionary. 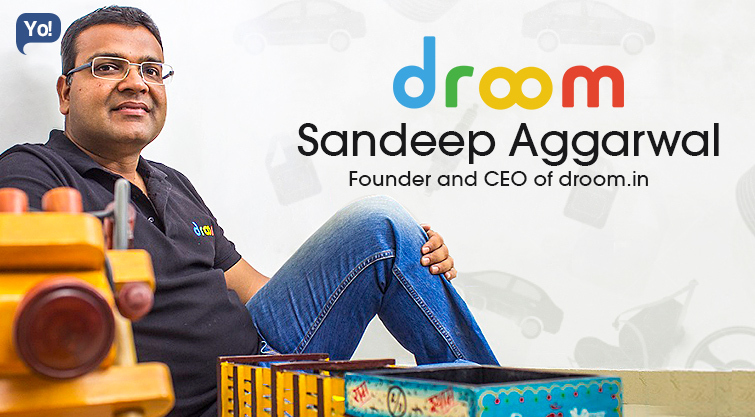 Prior to Droom, Sandeep founded ShopClues.com, India’s first and largest managed marketplace in his house in Silicon Valley in late 2010 and in August 2011 moved to India and led a team of three other team members to launch ShopClues. He has 17 years of global experience in business operations, strategy and investment, focusing on Internet and technology. In July 2013, during a family vacation in USA, I found myself in a middle of legal charges against me for my role as a Wall Street analyst 6 years back. This was a very big crisis and I had to think about basic level of survival and as big crisis a human being can face without dying. I had to stay away from my family for more than a year and had to relinquish any formal role from ShopClues, the company founded with utmost level of passion an obsession. This was not easy on any front. I had to develop lots of mental, physical and spiritual strength to deal with my personal crisis. I focused on survival, stabilization and get back to normal strategy for ShopClues and my family. It worked and while family still has lots of deep scars, ShopClues – rather than closing down, it is a $1.5 bn company today. We have raised closed to $20 million and the first round was done by the very same investors who were the first investors in ShopClues (the first company I founded). We have built very strong core values, competencies and work environment. So droom is like a cult. When we hire people, more than skills we look for droom core values and competencies. Those are the common thread. Due to these, people love working with us and give their best. Some of these core values include – high energy, passion, taking ownership, staying positive, being customer centric etc. We have very low attrition due to the great silicon valley style culture that we have. These two helps me to document all of my ideas. Constantly organizing yourself, taking notes for everything and communicating pro-actively. Do not give up. Entrepreneurism is a real test of conviction, resilience, perseverance, hard work and adaptation! Follow your dreams and obsessions! Not be fully honest to oneself as an entrepreneur. Always see glass half full vs. half empty and things will work out. I want to build droom’s as the most innovative and disruptive marketplace for automobiles on earth. I want to see ShopClues going public, and I want to invest in nearly 12-18 start-ups in net 3 years. I would not do it differently. I have no regrets how I shaped up my career and how I started my entrepreneurial journey.